I nominated both of our managing partners in the Grand Rapids office this year for the Grand Rapids Business Journal’s “40 Under 40” recognition. Atomic has always believed strongly in the power of pairs, and Mike Marsiglia and Shawn Crowley exemplify why that is. 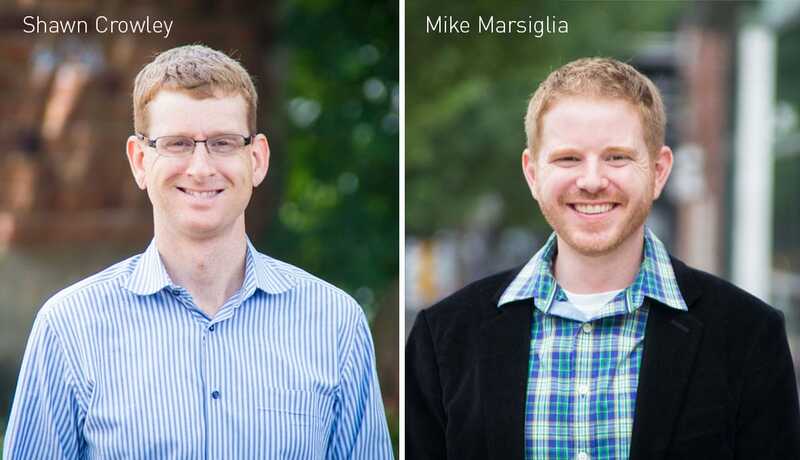 Since 2009 when they left development positions and effectively apprenticed themselves to me, Shawn and Mike have grown significantly in the scope and depth of their responsibilities and made invaluable contributions to Atomic. In January of this year, we officially pulled the trigger on our succession plan, and they took the titles Managing Partner, Grand Rapids, in addition to their Vice President roles, which span our multiple offices. Atomic’s revenue more than doubled from 2009 to 2013. That was only possible because Mike and Shawn grew so effectively into helping with the complicated, multi-faceted role of Managing Partner. Other significant accomplishments that they were vital to in that time frame include opening an office in Detroit, acquiring SRT Solutions, pushing Atomic forward so significantly on the design front, and creating our Employee Share Purchase Plan. Our long-time, trusted business advisor observed to me that he’s never seen two people work so well together, and work so selflessly. Shawn and Mike work to make Atomic a better place for everyone, making personal sacrifices for the greater good. They complement each other’s skills, share the pain, and spread the glory — in short, they embody our company values. I expected that it would be difficult for the Business Journal to select both Shawn and Mike for the honor in the same year. So while I was disappointed that they only picked one of my guys, I’m delighted that Mike Marsiglia was honored with the GRBJ’s “40 Under 40” award this year. Congratulations to Mike on a nice recognition of his achievement so early in his career. I’m privileged to work closely with these two amazing people, winners in my personal “2 Under 40” contest. "Battle of the Brackets" Supports Kids Sports – and it's Fun!